After getting laid off from her copywriting job, Geraldine DeRuiter hit the road, and began chronicling her travel adventures on her blog, The Everywhereist. Seven years and many, many posts later, the Everywhereist has racked up thousands of fans, millions of page views, and plenty of buzz: it was named one of Time magazine's Top 25 Blogs of the Year, one of Forbes magazine's Top 10 Lifestyle Websites for Women for three consecutive years, The Independent's 50 Best Travel Websites, and The Huffington Post's Top Travel Blogs. Whether it's eating roasted guinea pig in Peru, yelling at locals in Rome, or struggling to decipher the behavior of her fellow passengers ("Why would you use an airplane lavatory without shoes on? "), DeRuiter tackles travel with an equal mix of snark and heart as she hops around the globe with her husband, Rand Fishkin. "I laughed so hard during the book's 'disclaimer' that I woke up my baby, and then actively ignored him to continue reading. Geraldine is at turns laugh-out-loud hilarious and grab-me-some-tissues tender, and all I could think of after reading this was 'can we take a trip together please?'" "DeRuiter's funny, honest portrayal of life's small and large adventures will convince any hesitant would-be traveler that you don't need bravery or even an above average sense of direction to venture out into the world-all you need is a plane ticket and a sense of humor (and maybe a plunger)." "Getting laid off from a job she adored opened the door to the blogosphere for DeRuiter, as she explains this irreverent, yet warm-hearted memoir. Readers of her blog the Everywhereist will be familiar with the author's style of using her personality quirks and health issues as the foundation for her conversation with the reader and revelations on life. "I hail from a long, nervous line of hypochondriacs," DeRuiter explains. Being afraid of travel and lacking a sense of direction haven't hindered her but rather helped her explore the world. "So, if there is any advice I could dispense, it would be this: it's absolutely incredible the things you can learn from not having a clue about where you're going." 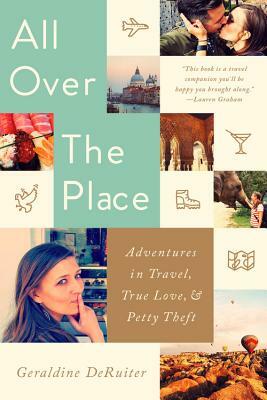 Her intimate memoir chronicles her adventures during the seven years she spent crisscrossing the globe, learning to understand and accept quirky family members. The author delves into her relationship with a workaholic-but-loving husband and a serious health crisis. DeRuiter's memoir is a light-hearted look at travel and learning to live life to the fullest each day, even if you not quite sure where you are going."